_From Padang Airport: Lake Maninjau’s closest airport is Padang, which is approximately 3.5 hours drive. Padang is just a one hour flight from Kuala Lumpur and Singapore and also receives direct flights from Jakarta and Medan. The airport is located on the road towards Lake Maninjau so it is faster to come directly here from the airport than to go into Padang first. At the airport you can get a taxi to Maninjau, or go out to the main road to get a public bus (which takes around 4 hours). The taxi will cost around 250,000 (after bargaining!) and the bus costs around 30,000 Rp. At the airport there are usually travel agents who can organise for a semi-private car to Maninjau. There are normally 5 or 6 other people in the car and the cost is around 60,000 Rp. We can also organise pick up from the airport, please just contact us to enquire about this. 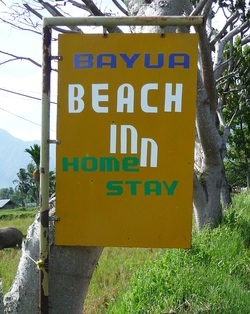 From Padang: At the Padang Bus terminal, take a Dagang Pesisir or Harmoni bus for the 4 hr trip to Bayua Beach Inn (get off when you see the Bayua Beach Inn sign on the right hand side of the road, about 500 m before reaching Bayur). T he Beach Inn is about 100 metres walk through the rice-fields, right on the edge of the lake. If you have any specific questions about getting here, please just e-mail.